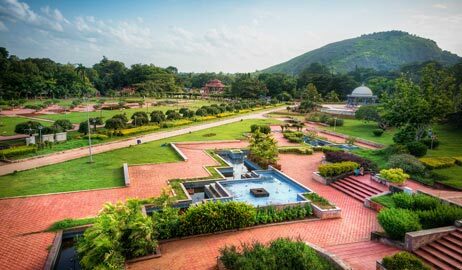 One of the most visited and famous attractions of Palakkad, the Malampuzha Dam and Gardens, is located at a distance of 7 kilometers from the main town of Palakkad. At the backdrop of this serene gardens is the mighty Western Ghats. The dam here is a combination of both masonry and earthen dam. This dam is built across the Malampuzha River, a tributary of Bharathappuzha in the year 1955. The Malampuzha Gardens is situated on the front side of the dam. With well laid out green lawns and flowers, this garden is a sight to see. On weekends and holidays this place is illuminated with lights. This garden area also has a hanging bridge, a Yakshi sculpture by Kanayi Kunhiraman and fountains. Near this garden you can also see various other attractions like the aerial rope way, snake garden and the only rock cut garden of South India, made by Nek Chand. Boating facility is also available in the gardens.